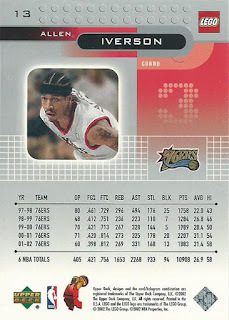 Last year I buried junk wax era cards and it got me wondering what modern chrome style cards would look like after one year underground. I am following the same exact experiment with the hole in the same location (southeast wall) with one card at 3-inches down and one card at 6-inches down. For this experiment I am using a 2017 Panini Prizm Eddie Lacy and a 2013 Topps Chrome Richard Sherman. I was not too worried about using the same cards this time because the Chrome and Prizm cards use the same technology even with a couple of years difference. I just wanted to use each company to see how their technology would do underground. The Prizm Eddie Lacy is at 3-inches down and the Topps Chrome Richard Sherman is 6-inches down. This is the last view of the guys until my 47th birthday next year, May 30, 2019. Last year I came up with the idea of doing a segment called “So You Don’t Have To” experiments with the intention of doing various things with my collection to show what would happen. My first experiment was suggested by Fuji, bury junk wax era cards in dirt to see how they would fair. 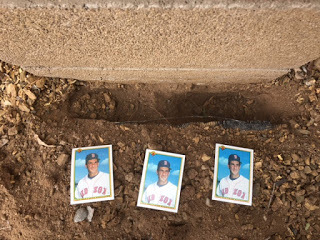 I buried three 1990 Bowman Mike Boddicker card in my yard on my 45th birthday last year and left them underground for one year. 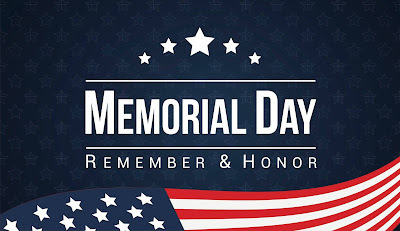 Over the past 365 days the temperatures hit a low of 14 degrees and a high of 104 degrees, we had rain (the backyard did get flooded at times), snow, hail and plenty of sunshine. 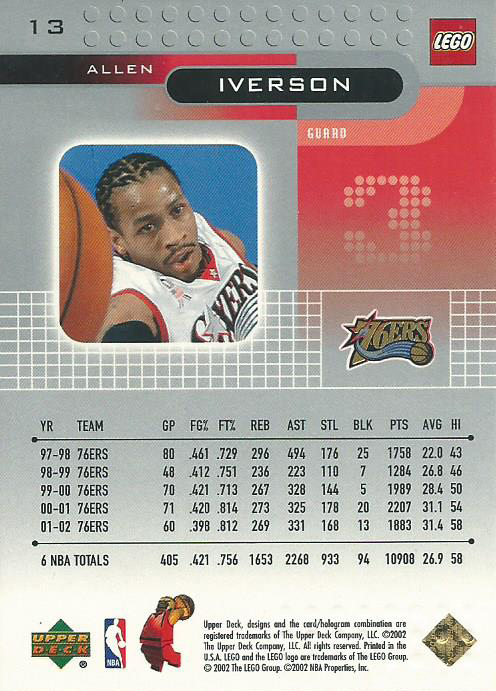 There were three major brush fires during that time and smoke and ash was around, not that I would think that would do anything additional to the cards. Today is my 46th birthday, so like Geraldo Rivera and Al Capone’s vault, I went digging to see what treasure would be awaiting me. The cards were placed at 3 inches deep and 6 inches deep, so I slowly removed the dirt, stopping to take a picture when I saw the first bit of cardboard gold, a small piece of blue as I closed in on the 3-inch part of the hole (Inside the red square in the image below). What I found (or lack of what I found) was a complete surprise. 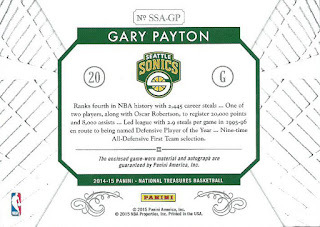 In the end I found less than 10 small pieces of the card with the largest being about 1.5 inches long. This was in the 3-inch deep portion of the hole, I found nothing of the other two cards that were buried 6-inches down. Turn in tomorrow for a continuation of this experiment. 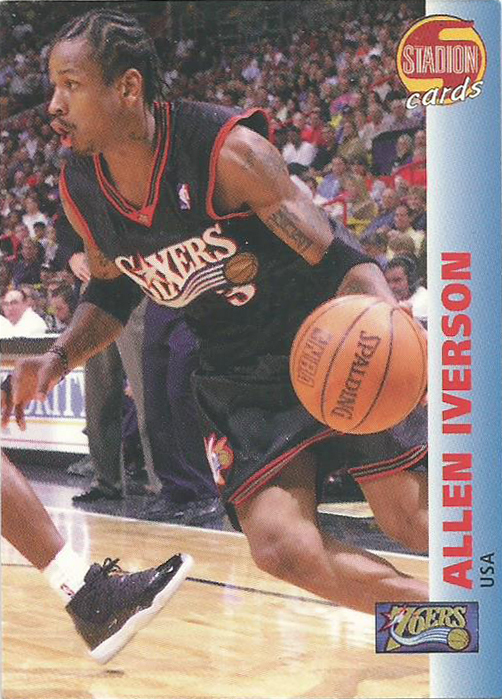 A couple of unusual additions to my Allen Iverson collection. 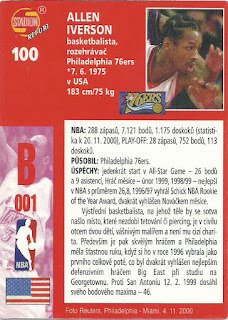 A 2000 Stadion Cards from the Czech Republic and a pair of 2003 Upper Deck Lego cards. 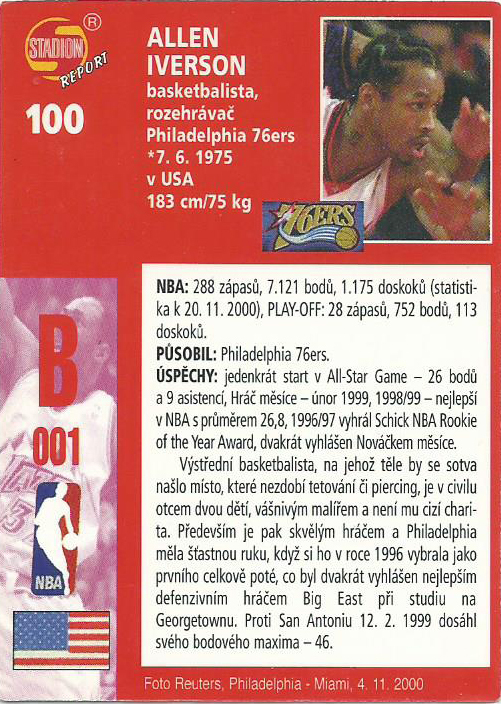 The Stadion cards were part of a multi-national/multi-sport set out of the Czech Republic and was made up mostly of soccer (football) and hockey stars but they got in a couple of NBA players like Shaq, Kobe and Iverson. There are also cards from tennis, racing and cycling, an interesting idea for a set. 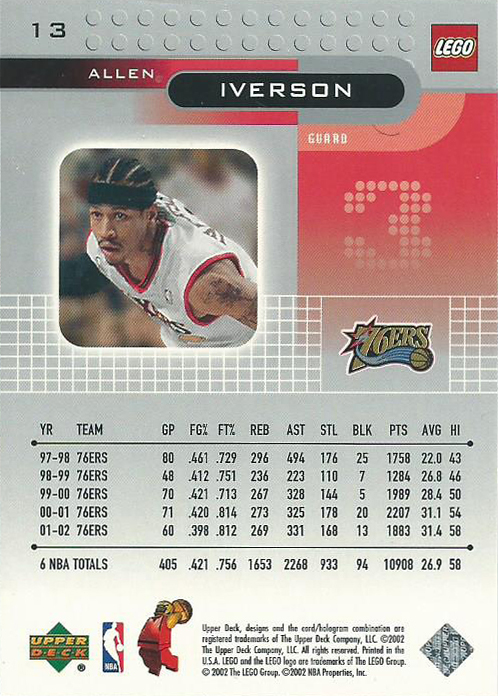 The Lego cards came from Upper Deck and I do not know exactly how they were distributed, I would expect as part of a promotion with Lego. The set is made up of 24 base cards as well as a 24 card Gold parallel, which have different images than the base set. I really hope this doesn’t become a regular type of post, but this is one of those instant regret purchases. 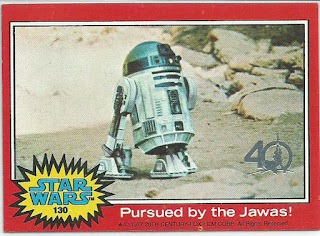 I got caught up in a sentimental Star Wars moment and ended up bidding on this 2017 Topps Star Wars 40th Anniversary Buyback card, winning with a bid of $3.25. Not a break the bank type of purchase but as soon as I bid I had that little voice in the back of my mind question it but I have never retracted a bid, and if I did it would only be if I typed in a wrong amount. I also didn’t cancel the sale because I made the bid so I made the payment, my second guessing shouldn't affect a seller. 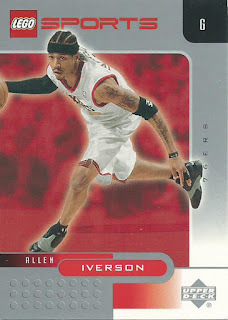 At least the card does fit in my collection so it wasn't as bad as it could have been. I have had mail days where the packages came boxed up like Fort Knox and not long ago I saw someone post about getting a mail day where it was a card wrapped in the order printout from eBay and that was it, probably one of the worst shipping ideas I have ever heard of before. Today was a mail day where I am pretty sure the sender walked through their kitchen for packaging material ideas. A brown paper bag, a box from a bar of soap, a bit of bubble wrap and a Ziploc bag plus a copious amount of eBay box tape. I can’t complain, outside of the soap smell, because the cards were safely secured, just some unique options. 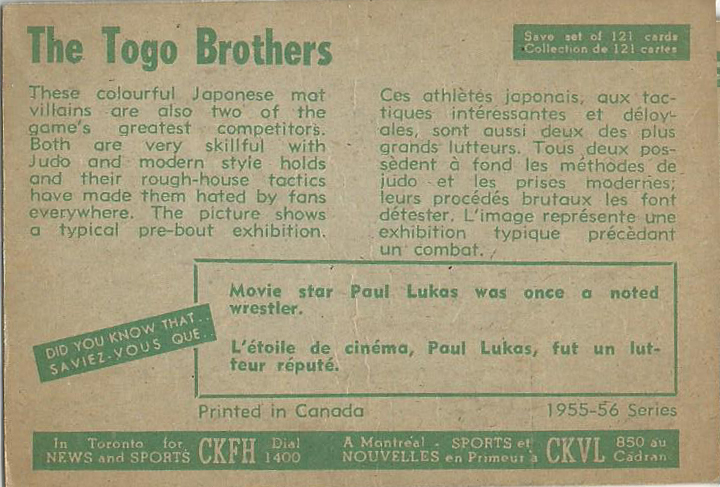 This month’s VCoM are two cards from the 1954-55 & 1955-56 Parkhurst Wrestling sets and both cards are two of the three Togo Brothers. 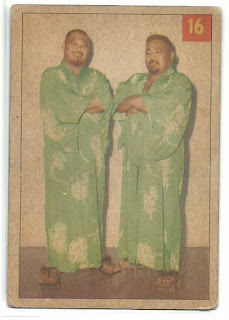 The first card is the 1954-55 Parkie and it shows Ko Togo (L) and Tosh Togo (R) from a promotional shot. 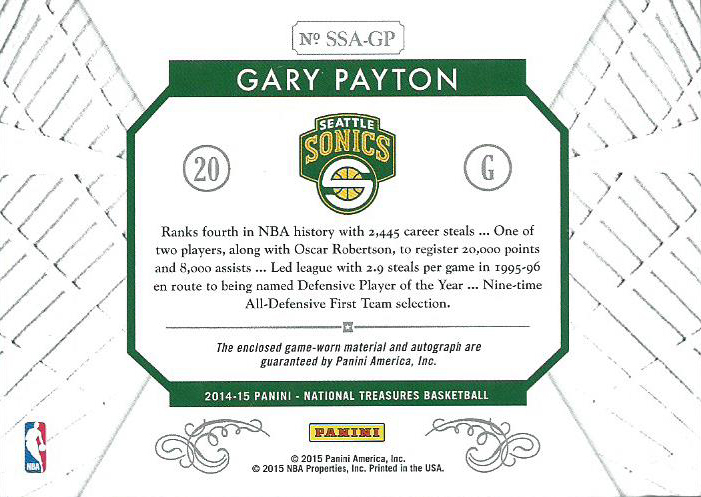 This card has a “Lucky Premium” back instead of the regular 1954-55 back. These backs were instant win cards of sorts and offered mail-away offers where you had to send in the card plus the cost (I am guessing for shipping and handling) and you got the item on the card back. 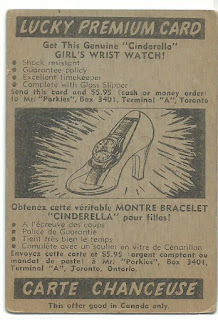 My card is for the Cinderella watch but some of the other items were a flash camera with a 50mm lens ($3.75), a high powered giant field glass ($2.00) and a Hopalong Cassidy boy’s wrist watch ($5.95). 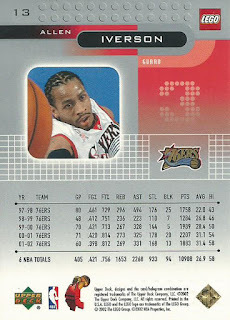 When the cards were redeemed for the item they were kept by the company so cards with the Lucky Premium back are not as common as the regular cards. 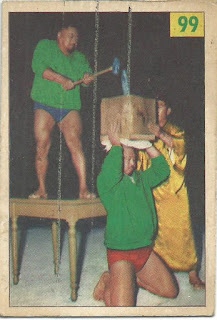 The second card is the 1955-56 Parkie and shows Tosh Togo (L w/ hammer) and Ko Togo (R w/block). This was a time when wrestling was real but the three were more than wrestlers. 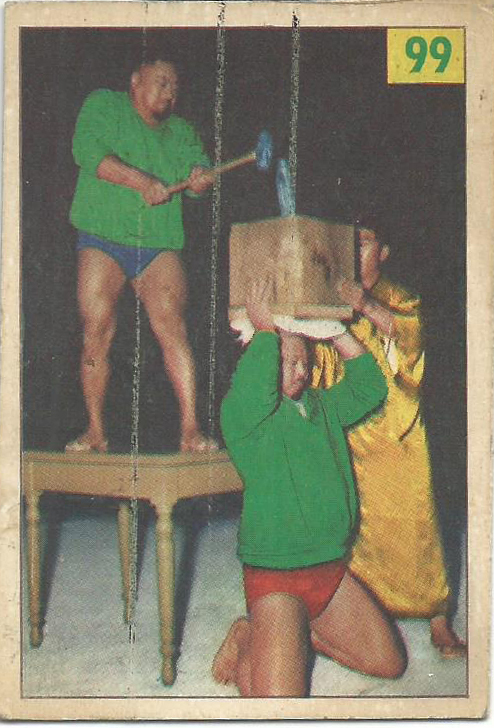 Previously I had talked about Tosh Togo (The Great Togo, aka Harold Sakata) being a weightlifter but the other two were master martial artists so they often did other events where they showed off their skills, and I am figuring that this cinder block break was at one of those events. 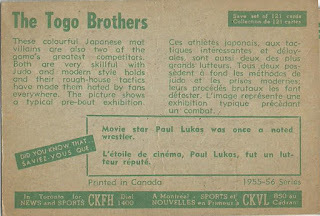 There were three Togo brothers though none of them were actually related. 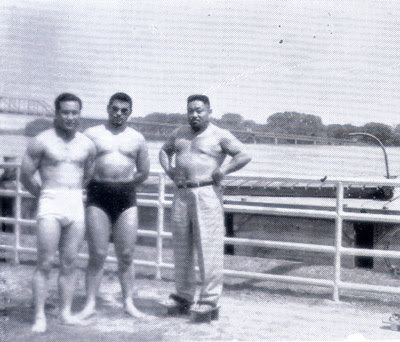 There was Tosh Togo (Toshiyuki/Harold Sakata), Ko Togo (Kokichi Endo) and Mas Togo (Mas Oyama). 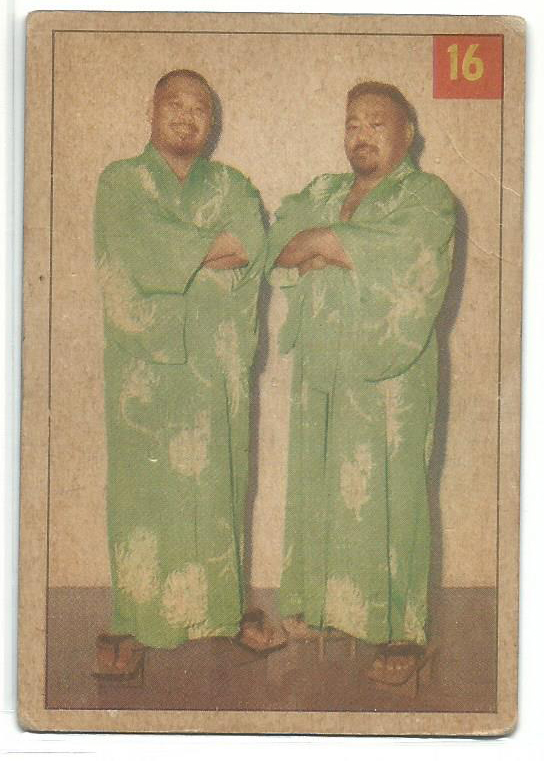 Ko Togo and Mas Togo do not have their own cards in either set and I haven’t been able to find any cards featuring Mas at all. I did come across a picture of the three “brothers” together. 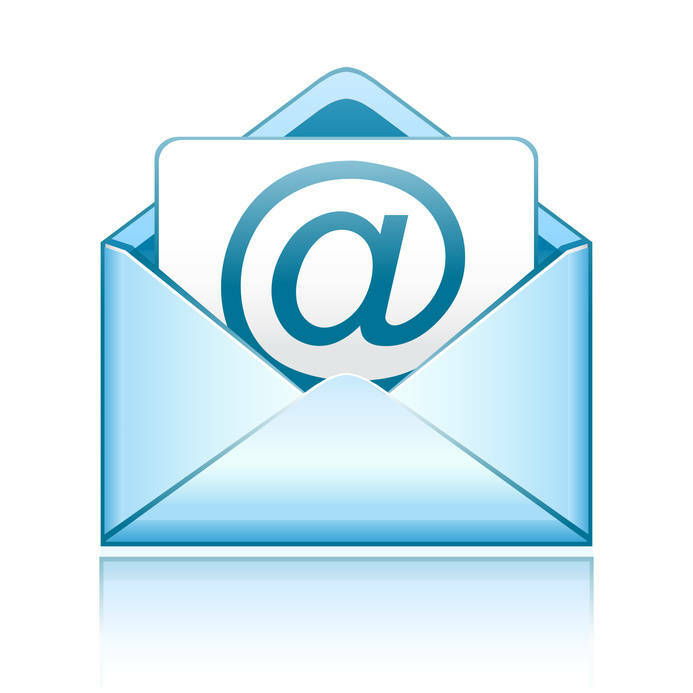 Monday Question Day- Are We Missing Out? 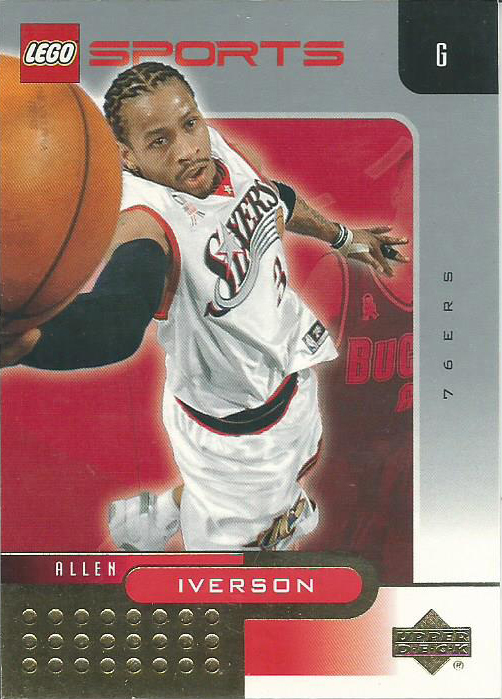 Do you feel like you are missing out on collecting if you are a fan of a newer team? 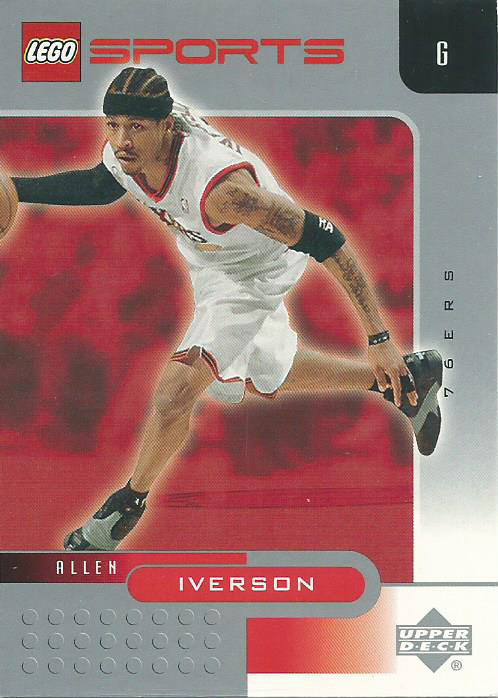 In my lifetime expansion in sports has been a regular occurrence and with expansion comes a whole new group of fans. These are fans that get to be there from the start, but vintage collecting is out the window. 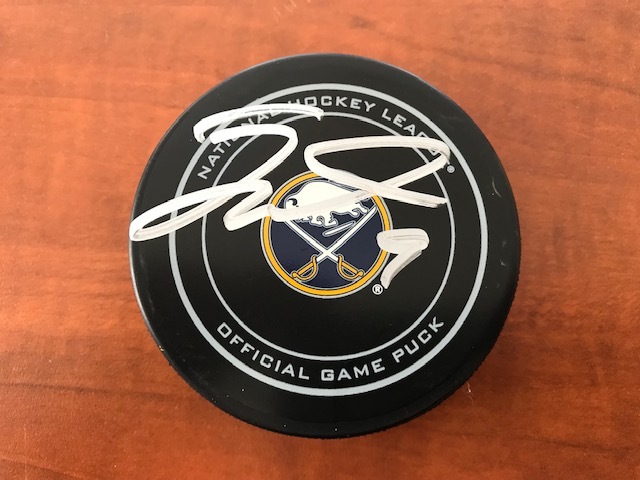 There are baseball teams over a century old, hockey teams too, football has teams going back to the 20s and basketball from the 1950s but the teams I collect are newer in comparison. 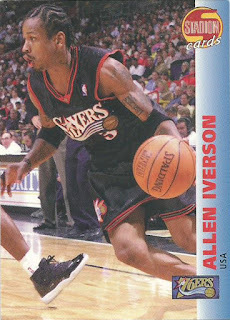 I think I have compensated by picking up vintage cards of players I like but I still feel like I am limited. This month’s Art Gallery display comes from an artist that has done so many prominent sets and is considered one of the top artists in the sketch card world, Brian Kong. 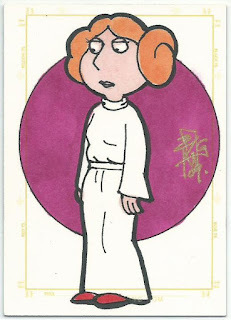 The card is of Lois from Family Guy as Princess Leia and is a PSC (Personal Sketch Card) from 2009, probably a commission since it is on Brian’s personal sketch card blank. 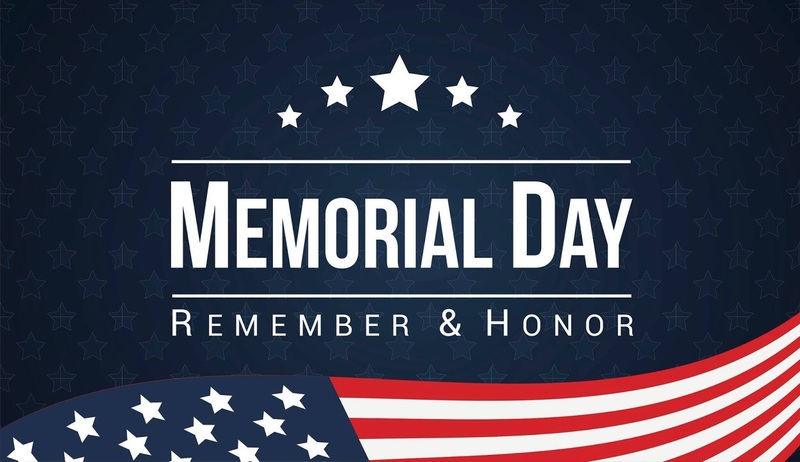 If you haven’t guessed I am a Family Guy fan, it is one show that my son and I enjoy watching together and we probably have more inside jokes based on Family Guy references then a father and son should have. 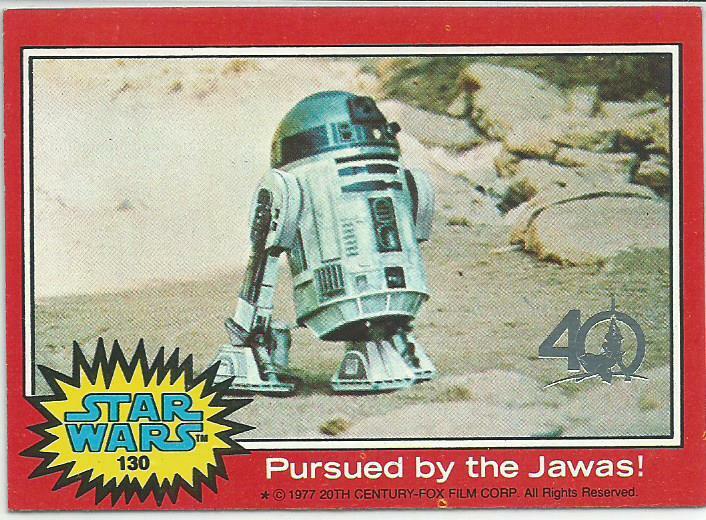 My favorite episodes were the three based on the original Star Wars Trilogy; Blue Harvest, Something…Something…Something Dark Side and It’s a Trap!. There are official sketches based on those episodes that were packed out in the 2011 Leaf Family Guy release but they are quite expensive so I look for other options and this is my second ACEO Family Guy Star Wars sketch card, the first being Stewie as Darth Vader from Nicole Falk that I picked up in 2015. The tweet from Rosenthal says it all, Robinson Cano has been suspended 80 games for testing positive to a diuretic, Furosemide, prior to the season. Cano admitted that he took the diuretic because it was prescribed by a licensed doctor while he was at his home in the Dominican Republic during the off season. The problem is that Furosemide is used as a masking agent for steroids and the MLB drug policy requires the MLB to prove that is was being used with the intended use of steroids, so this doesn’t look good. Cano has agreed to the punishment and will not appeal the suspension, which will cost him $11.85 million in lost salary as well as being ineligible for the All-Star game and any post season playoff games. Monday Question Day- Could You Change Your Main PC Player? Have you ever considered selling off your main PC and focus on a minor PC? I am sure that most of us have had this question crossed our mind but has anyone seriously considered it or do you know of anyone who has done it? I would imagine it would be a very difficult undertaking no matter the reason and you must consider selling it piece by piece or as one complete collection. It has crossed my mind but I would never sell off my Griffey PC unless it was absolutely necessary due to a catastrophic event though I have thought about the logistics and numbers involved. I figured that if I were to sell my Griffey collection, if I didn’t need the money for other things, I could purchase every Buhner and Bader card ever made and have a couple bucks left over. 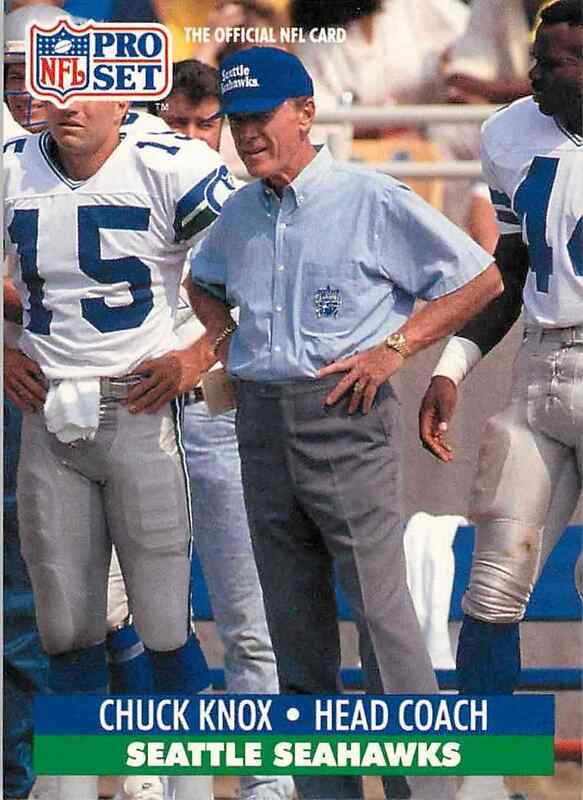 This morning, long time Seahawk’s coach Chuck Knox passed away at the age of 86 years old after a lengthy battle with dementia. 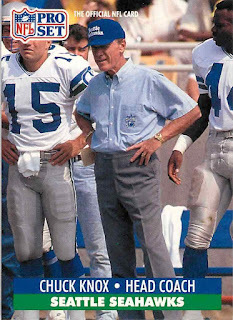 He wasn’t the first Seahawk’s coach, but he spent 9 years in Seattle and was who I remember leading the team when I first became a Seahawks fan. 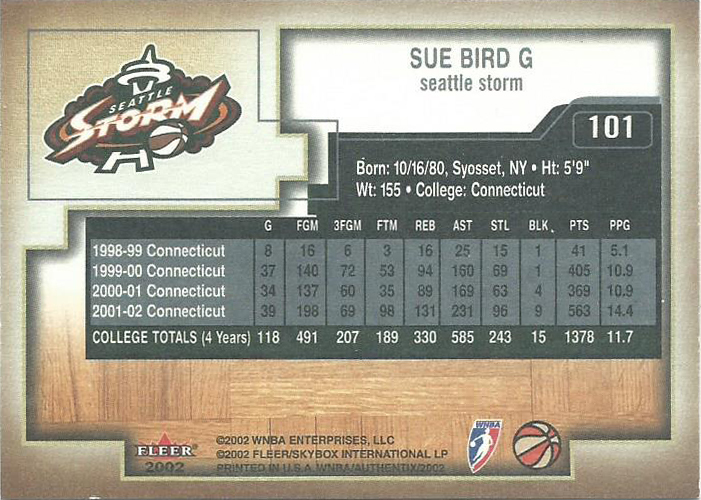 Coaches don’t get much cardboard love but during the heyday of the Pro Set and Pro Line years coaches made appearances each year, so Knox has a couple of cards between 1989-1992 including a couple of official autograph cards. Can you really have too many cards of Captain American punching out Hitler? I actually have two copies of this 2010 Rittenhouse Marvel 70th Anniversary card so I guess the answer would be "No, you can not have too many." This month’s Art Gallery display comes from Denver Brubaker, a cartoonist from Michigan, who has a very comical Sunday morning comic strip style that we all loved as kids. His style is a lot of goofy looks, large eyes and smiles as well as gangly limbs so you can see most of that in this sketch. 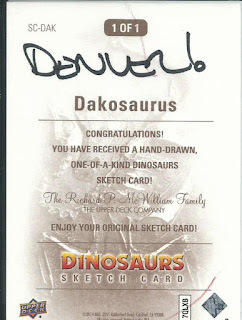 The card is from the 2015 Upper Deck Dinosaurs release, which was the beginning of a dinosaur revival in 2015-2016, and easily the best of the multiple dinosaur releases. 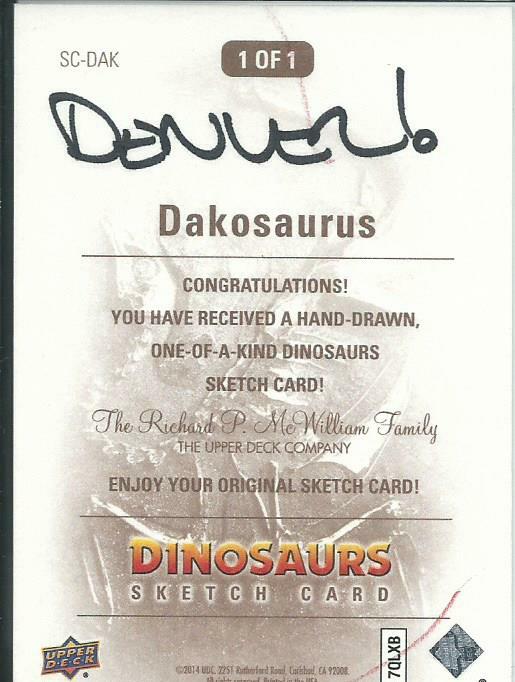 What caught my attention with the card was the fun of it where most artists went a realistic route with their sketch cards Denver stuck to his style and I love it. I cannot even tell you what kind of dinosaur this is but he is enjoying his life no matter. 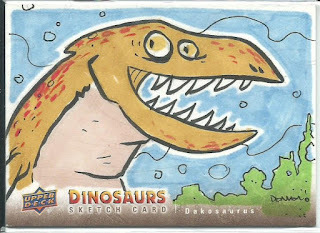 Adding to the happiness is the vivid colored and strong lines, just a great card in my eyes. Two weeks ago I served jury duty and with the per diem and mileage I ended up with a check just over $35, so some extra spending cash for the month. The hobby gods were watching out for me and a HUGE card that I felt is missing from my collection showed up for auction starting with a $15 opening bid, a 2002 Fleer Authentix Sue Bird RC (plus a Swin Cash RC). I put in a bid for $35.09 and held my breath, the auction ended at $31.00 plus $3.49 shipping. 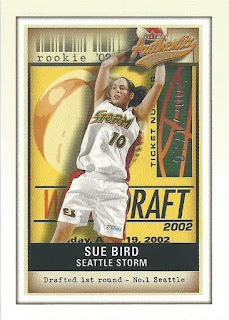 This is amazing, just two months ago I had posted about this Sue Bird rookie card in one of my Monday Question Day posts. 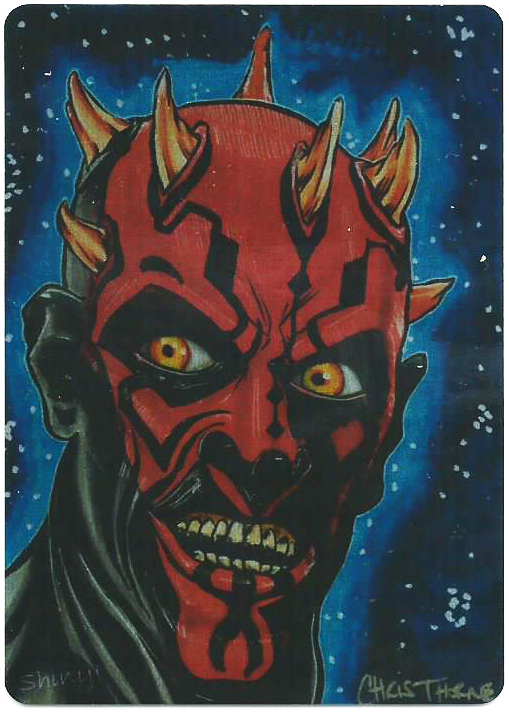 It is Star Wars Day and I am going with a neat piece I received as a throw in from the seller, who also happen to be the artist who did the art work for this Faerie Metal San Diego Comic Con give away. 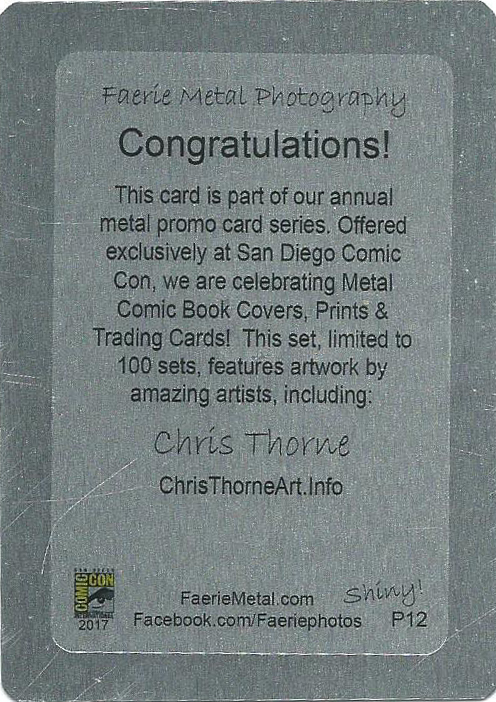 The artist is Chris Thorne, who has done sketch cards for Breygent, Cryptozoic, Cult Stuff, Upper Deck and Topps, and he was selling some of his SDCC metal cards. 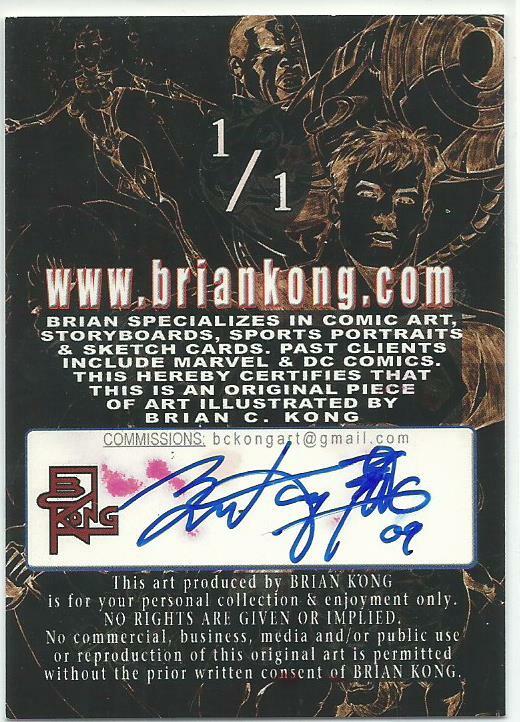 I ended up on his eBay store looking for a metal Captain Spaulding (Devil’s Rejects) card that he had up for auction and saw this Darth Maul metal card too, but I decided to stick to my budget and only bid on one card and I chose the Captain Spaulding card. 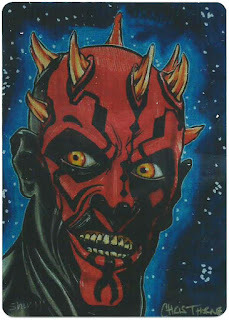 When I received the package, Thorne had included the Darth Maul card too.. I wouldn't say everything is coming up Millhouse but this was really cool of him to include both cards. There was an odd turn of events when the Mariners announced this morning that Ichiro was being released. He is batting .205 with nine hits in 44 at bats, so he has shown signs of slowing down a bit and I think that people were expecting him to announce his retirement some time this season, but this was kind of unexpected. But the Mariners also announced that Ichiro will be taking on a position in the Mariners’ front office, so he will be remaining with the organization. Some reporters pointed out that nowhere in the announcement does it say that Ichiro is retiring so this doesn’t mean that he is done playing so we will have to wait and see. 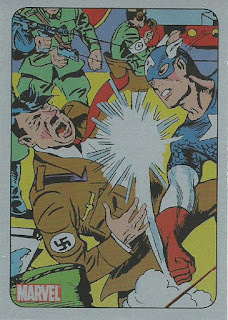 A one card post today, but a cool one. 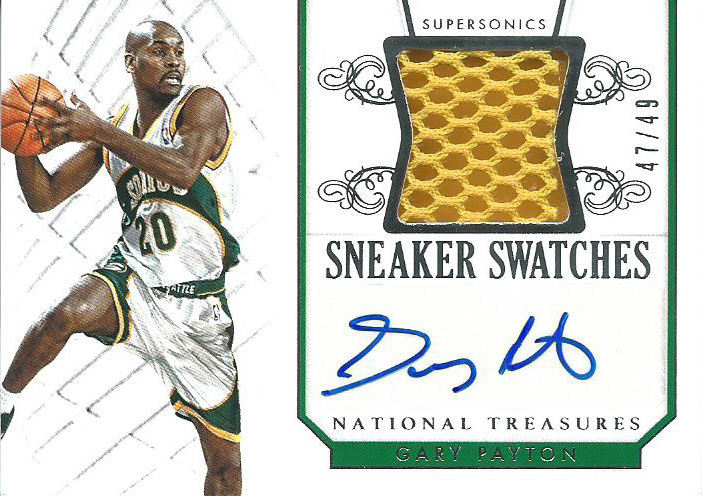 I picked up this Gary Payton 2014-15 Panini National Treasure Sneaker Swatches shoe card late last year. 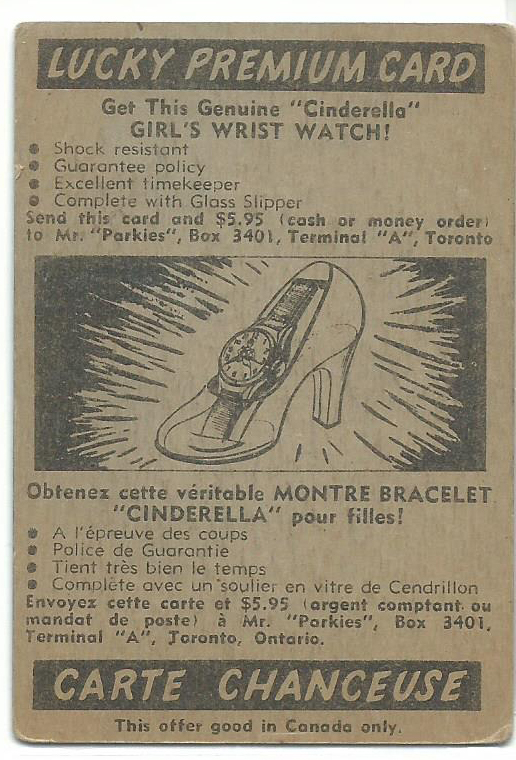 I’ve always thought that shoe relics are some of the neater and more unique relics.